They may freak you out when you first see one, you may panic that your dog is going to become incredibly ill if you find one attached, perhaps you just don’t know what they are. Ticks are actually an incredibly common problem for dogs and humans that enjoy venturing into the great outdoors but, with a few careful precautions, they can be easily managed. Ticks: What Are Those Yucky Little Blighters? What Kind of Diseases do Ticks Transfer? Where Are You and Your Dog Most Likely to Pick Ticks Up? How Do You Spot Ticks on Your Dog? How Do You Safely Remove Ticks? What Can You Use to Try to Prevent Your Dog Picking a Tick up in the First Place? Ticks are a parasitic creature, from the arachnid family (even though they may look more like a bug) that feed on the blood of their host. Amongst the Hard group of Ticks, there are a number of species. The Deer and the Brown Tick are two commonly found on dogs. The Brown Dog Tick is the only species that can survive its entire lifecycle completely indoors so they can end up breeding in your home if not dealt with swiftly. The Deer Tick (sometimes also called the Black-Legged Tick) is the one that can cause the most problems with transferring problematic diseases and it is commonly found on wild deer and sheep. They can range in size from anything as small as a pin-head right up to the size of a marble when fully engorged. Lymes Disease is the most common and problematic disease that can be transferred by Ticks and this is often passed on via the Deer Tick. It is a serious bacterial infection and, if contracted, it can make you or your dog seriously ill and, in some rare cases, lead to death. Symptoms of Lymes Disease can include loss of appetite, a high fever, pain and swelling of the joints, impacted mobility, swollen lymph nodes and it can also impact on mood leading to depression. Dogs and humans can develop arthritis as a result of contracting the disease. Be aware that symptoms can take weeks or months to manifest after the tick bite has taken place. Some doctors and veterinarians recommend that, after a tick has been removed, that it is killed and then contained in a sealed container with a date for when it was found and held onto for a number of months before disposing off. That way if there is a chance that Lymes Disease symptoms appear, it can help to know when it could have been contracted. Ticks can also carry other diseases, depending on which country you are in, including anaplasmosis, ehrlichiosis and Babesiosis. These are usually rarer though and Lymes Disease is the one that carries the greatest possibility of being contracted. Ticks are commonly found in areas where they can breed and feed easily. The Brown Tick is frequently found in forested areas, thick grassland and in areas with large amounts of heath and undergrowth and a flourishing wildlife population. They are commonly found on deer, sheep, foxes and hedgehogs and they can easily transfer to you or your dog. They do not fly or jump but they will climb or drop onto your dog as they brush past whatever they have been inhabiting and then latch on from there. Ticks can smell hosts coming and will be actively attracted to a dog or human host. If your home is in a more rural area or one that gets a lot of visits from wildlife there is more chance of ticks being found there too. They can be picked up at any time of the year but the warmer months, from Spring through to Autumn are the times when they are most prevalent. If you are in an area that is extremely tick infested it may be a good idea to keep your dog on the lead and have them stick to the well-worn paths. Allowing them to roam off into the deep undergrowth, long grass and forested areas is likely to increase their chances of attracting more ticks. If your garden is an area that attracts a lot of ticks, keep the lawn mown short. Ticks don’t like very sunny and dry environments, they are attracted to damp, moist, highly vegetated areas. Remove piles of damp wet leaves and try to avoid encouraging other wild animals into the area (keep bin lids secure and don’t leave out food). If you are camping with your dog try to pitch your tent in a dry, clear area to minimise the chance of ticks getting into your tent. It is really important to make sure you thoroughly check your dog for any ticks after any walks in areas like those mentioned above. They can be tricky to spot, especially on a fluffier dog or darker coated breed as they wheedle deep down into their coat and can be hidden in warm, sheltered areas, like the armpit area or groin. They are also found on the extremities where it is easiest for them to latch on. You can often find them around the eyes or ears, having caught on when your dog may have stuck their face into a lovely smelly patch of grass for a sniff, or around the paws area. The tick does not always latch on to bite straight away but will move around trying to find the best place to park itself. By using a fine comb and brushing this through your dog’s coat you can increase the chances of dislodging a tick before they have bitten. Just make sure to always pick up and dispose of any tick you may have dislodged. If your dog is not keen on being combed, take it slowly, use lots of yummy treats and work on getting them used to having a grooming session in advance of when it becomes a necessity. Once a tick latches on they can be tricky to remove without leaving the biting mouth/ head still attached and then this is very difficult to get out. Tweezers are often recommended and, whilst they can work, it is really tricky to master the right technique to get them out whole with these. We would always recommend having a couple of Tick Twisters as part of your essential doggy supplies. They are really invaluable and work for removing them from humans just as well. They work by latching themselves securely around the body of the Tick and then you twist the tool very slowly and this causes the beastie to release its grip meaning you can easily remove the whole thing and not just the body. Also, be careful not to accidentally squeeze the body of the Tick, not only can it be disgusting if it pops and then it will not be so easy to remove the head too, but it can also increase the chance of spreading any infectious disease they may be carrying. Other methods that are often suggested are burning the Tick off or smother it with petroleum jelly. Don’t bother with these risky, often ineffectual methods. They rely on waiting for the tick to die and this takes time, you want to get rid of the Tick as quickly as possible. Trying to burn it off can put your dog at risk of being hurt too. Sometimes the Tick will not release it’s bite even after it has died anyway. Just get a tick twister and you are all sorted! Make sure that after the tick has been removed that you don’t just pop it in the bin where it could still be alive and crawl out to latch on again. Try not to handle the tick directly unless wearing gloves to prevent the chance of any possible infectious disease being transmitted. There is a chance of this if you have any cuts or broken skin. I usually flush them down the toilet but you can pop them in a sealed bag or container or submerge them in alcohol. Ticks have been known to climb back out of the drain and have been known to survive a full cycle in the washing machine or going through the tumble drier. They are hardy little things! Also, make sure that you thoroughly clean the area that the tick has bitten and then keep an eye to make sure there are no signs of it being swollen or painful or of a rash developing around the bite area. Don’t panic though if you do find a tick. Most of the time it will be fine if you remove it and clean the area. 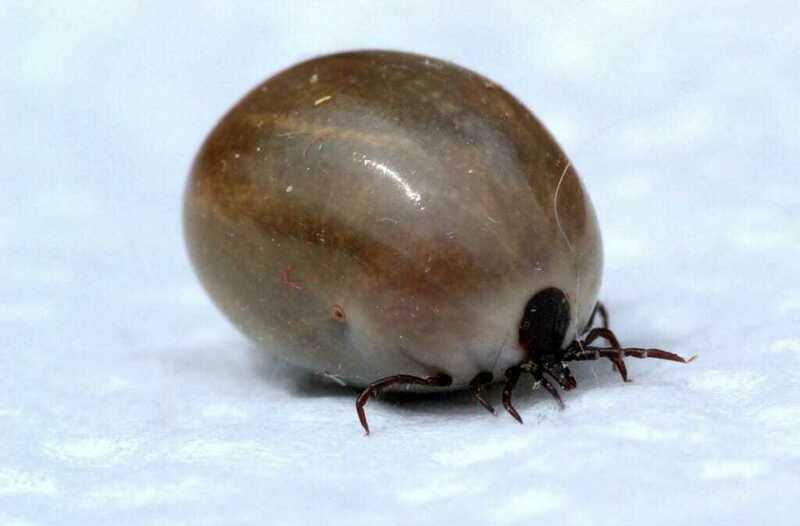 For Lymes Disease to be transmitted the tick usually has to have been engorged for a number of hours on the host for any risk of spread and not all ticks carry the disease anyway. Be aware that ticks that are brought into the home can settle there and breed. It is important to always ensure you do get rid of any ticks quickly. Regularly hoover (and empty the hoover bag promptly), keep the house clean and clutter free and use a safe and appropriate home treatment if the problem is not containable. There is nothing that will completely eradicate the chance of a Tick latching onto you or your dog, but there are things that you can do to help minimise the chance. There are preventative treatments that can be bought in pet stores or through your veterinarian. Always do your research on which one works for your pet best. Some are applied as a monthly spot on to the neck and others can be taken orally. Most of them will not stop the dog having a tick latch on but rather they will die on ingesting the blood and then fall off quickly. There are also natural remedies that can act as a repellent and disguise your scent for those that are not keen on using chemical products. Again they are not full proof but some can help to minimise the chances of a tick latching on. Some people swear by Diatomaceous Earth which creates a scratchy surface on the skin that the ticks do not like and that can actually injure or kill them Diatomaceous Earth is a sand-like powder that is made up of crushed marine and freshwater fossils. It is non-toxic and is often applied topically to the coat as a flea and tick preventative. Care must be taken not to apply too often or in too thick a quantity as it can become uncomfortable and irritating to a dogs skin if overused. You can also add certain herbal mixes to your dog’s food and this means that your dog will have a scent that will put off the ticks from latching on, neem oil is a common constituent. Make sure that it is a safe and approved product before using it and that the dosage given is appropriate. Before heading out on a walk in an area that is likely to be tick infested, some owners will put a few drops of doggy safe but tick repellent essential oils onto a collar or bandana. Rose Geranium is one of the most commonly used (although this should never be used on pregnant dogs or on cats at all). Some people swear by Apple Cider Vinegar. Some scents may be ones your dog does not like either though so be sure to check their reaction towards the scent before making them wear it, you don’t want them to be uncomfortable or in distress. It is also important that if you are using herbs or essential oils you double and triple check that they are appropriate and safe to use around your pet.